This photo is one of the older landscapes in my archives. I took this one back in September 2009 while visiting the Kgalagadi Transfrontier Park for the first time in years. 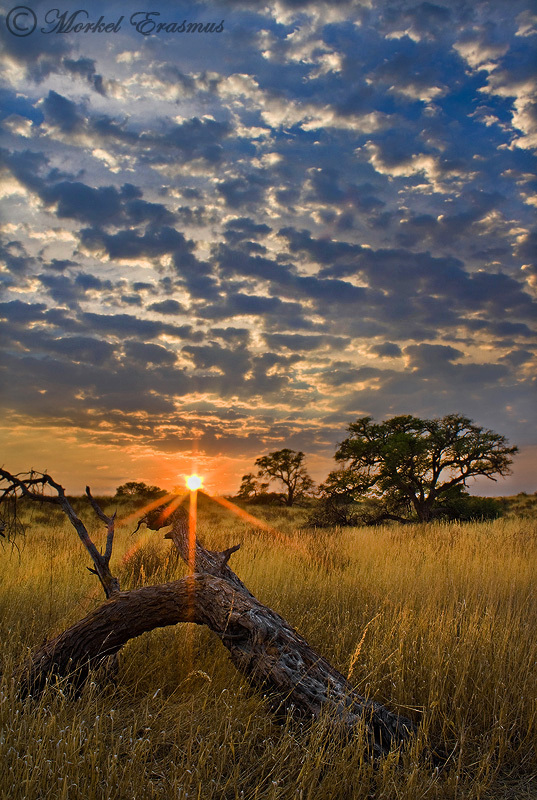 It was captured behind our tent in the Kalahari Tented Camp (where lions often roam through since there are no fences). It was taken with my first entry-level DSLR and a kit lens, but you know what? I still like it. This photo was also processed by blending together 3 exposures of the same scene manually. I used an aperture of f22 to create the sunburst. My new Nikkor lenses great much more pleasing sunbursts, and that's one advantage of a high-end wide angle lens for sure. What do you think? Are there some "old" shots in your portfolio that you still cling to and enjoy viewing? This one takes me back to a lovely morning in one of my favourite parts of Southern Africa...smelling the smells and hearing the birds and feeling the glow of the sun on my face, with a lion roaring somewhere in the distance.